I just wanted to say that posting my job on EmploymentCrossing was the easiest job posting I have ever done!!!!! Great job making the board user friendly. Please let someone know of my appreciation…. So far, a very happy customer. I wanted to let you know that we filled our position with EmploymentCrossing within the first month! We will definitely be using the service in the future. Great Response! Good quality prospects with the experience we are looking for in a recruit. We will use this service for all future hires. 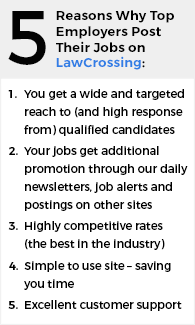 Posting my jobs with EmploymentCrossing was quick and easy and got me some really great candidates right away! I don't always have the easiest time trying to fill some of the very unique positions that we hire for, but since I have started using EmploymentCrossing, it is so much easier. I had not heard of EmploymentCrossing before, but I was searching for job boards that specialized in a specific niche (Accounting) and came across AccountingCrossing. I didn’t realize that you had a Crossing site for all kinds of different industries. I decided to give it a try and within 2 weeks, I had several candidates from your site scheduled to interview. It’s great when you can find something that actually works. I found exactly the people I was looking for, with some help from EmploymentCrossing. You are most generous and I thank you so much for all your help and assistance. The account was reactivated and we are receiving resumes so thank you again and we appreciate all your help and follow-up. We will highly recommend you to others in the future who are either looking for jobs or looking to post jobs. Regarding the process of signing up online, posting the ad and billing, I am happy about how fast and friendly your online system is. After posting and paying, I received an acknowledgement and link to the posted ad. Thanks! The job posting process went very smoothly and efficiently. The account representative was very responsive. I was also impressed with the numerous articles available on your site. Thank you. I had a good time using the website and it was very easy to post. We are getting good responses from the job seekers and as a result we have started the interviewing process. I was very happy to utilize the service. I did get quite a few responses from job seekers and am overall happy with the website. I did receive quite a number of responses through your website. It's been a while that I have posted something but I will comeback if I have any openings, but overall I had a good experience with your website. The site was very user friendly. Got a few applicants and was happy with it. The site was easy to use and we did obtain some interest via the site. Thank you for the opportunity. It was easy to post the jobs and we did get few applicants and it was a nice service which can be used again. We advertised few jobs on the site and we were quite happy to receive many applicants for the position and would surely come back as and when we have any hiring opportunities. The experience was good. I didn't have any problem with the website as we had a good time. We had posted couple of jobs on the site, for one we received tons of responses, which actually was a good one for us. I have to say that we have posted numerous jobs on the website, and we did receive good number of responses. We had positions for multiple states, and all had satisfactory results. I did this posting for a client, and I have to say it was very effective for them as they were able to fill the position. So I am very satisfied with the website as it was good and functional. I did receive good number of responses for my posting. I only posted one job but the response was excellent, so I am very satisfied with the outcome. I did receive a fair amount of response through your website. I would say that about 75% were on target, we also had the opening on our website, and finally we selected the right candidate. I did receive couple of excellent candidates through your website. My EmploymentCrossing experience was fine and there were some good replies too; would love to come back and post as many requirements as I have. I am no longer working with the company. But I do recall that we got good number of responses. I think we got around 12 in couple of days, and the job was filled within a week, so overall the experience was good. It was a good experience posting a job on the site. The functionality was very easy to use and will surely come back as I get some requirements. I did receive good number of responses for my posting, out of which few were very promising. We eventually filled the position, so the website worked fine for us. My experience with EmploymentCrossing was good. The job posting process was easy. It was also easy to make the payment. The client informed that the job was posted by a different person, but they did receive a good number of responses and eventually the position was filled, so the experience was good. I am very much satisfied with the website. I received good and adequate responses for my postings as a result we hired a candidate for the job. I think it went well for me, as I was able to generate good number of responses from the job seekers, so it was a good experience. It was fine, the process was easy, would surely get back if required to post. The process was very easy and fun to use, and we got good responses. We will come back again and again when we need to fill up requirements. The job was posted by the HR. She informed that the website was very comprehensive and user friendly and it worked exactly how they wanted it to be. So, the goal set was achieved. I think the website was very helpful and was easy to post. In terms of responses, it's hard to say because we had informed the job seekers to apply from our website, which was eventually filled. So I can't provide any figures, but the experience was good. We were very pleased with our use of EmploymentCrossing. We have no complains with the job posting service, and would definitely use it again in the future. I did post a couple of jobs on the website, the latest one didn't yielded many responses as compared to ones before that. But overall the experience with the website was good, and found it easy to post jobs. The experience was wonderful, posting the job was very easy and also got a few responses which was fruitful. The service was good, the process was smooth and easy. We did receive applicants and are well satisfied with the amount we paid for the posting. The website did work very well for me. I was able to get good number of responses for my posting, it was a bit expensive but overall it was good. I had no problems with the working of your website. I was able to post jobs easily. I think it went according to the way we wanted, and I am very happy. We didn't have any problem with the website and the responses were also good. It was a good experience. It was a very easy process to payment and posting , and it was very user friendly site. We would surely come back if we would like to post further openings. Also we did receive good number of relevant applicants. I used the website for posting a job for one of our recruiters. I have to say that I was pretty impressed with the quality of the service; it was very user friendly and informative. I was very pleased with the quality of the service, we did receive a good number of positive responses for our posting, so we are happy and look forward to working with you in the future. The experience was really good and we would surely post more jobs and would also like to get more applicants. The website is really easy to use. I have to say that I did receive quite a few responses (around 20). The website was good, informative and user friendly. We think we got lots of responses for our posting, but the sad thing is that we didn't get right candidate, as it was a unique job and we were looking for a person who had specific qualities. It had nothing to do with the quality of the service, we were very much satisfied with the service. It was easy. The payment was also low and I would surely love to come back and post if I get some more jobs to post. I did have a very good time using the website. We received the responses (in terms of candidates) which we were looking for. So we are happy and will be back in future if we have any new openings. I think the website was great. It worked very well and we received more number of responses than I expected. The quality of the service was excellent. The website was good and helpful. The job was posted for a recruiter and they were eventually able to fill the position. Overall it was satisfactory. I was very satisfied with the website. We did receive quite a few resumes for our posting. The website was good, and we would come again in the future. We are an advertising agency and we regularly post jobs on the website, and we are very much satisfied with the service. The service was good and easy to use. The posting part was easy and the payment was also affordable. The process of posting the job was very easy and the payment method was secure. Also, there were no issues in proceeding further. I had not used EmploymentCrossing to post jobs in the past, but had come across your information and decided to give it a try and could not believe the positive response I received. We were able to hire one of the candidates who had applied through your site. Thank you so much for providing such an excellent service.